Joel Walters, who was brought to Missouri to run the taxing agency in 2017 by former Gov. Eric Greitens, was replaced Friday by Gov. Mike Parson. Walters weathered months of tough questioning from lawmakers over his role in altering the state’s withholding tables after the federal tax cut went into effect last year. Walters, who earned $128,200 in 2018, was not available Thursday, an agency official said. Walters testified several times to the Legislature that the state’s withholding tables didn’t correctly account for the standard deduction — the amount of income taxpayers can subtract before income tax— in calculating the federal income tax deduction. Walters said the withholding error had been discovered in September after existing for at least 15 years. Walters ordered changes to the tables that he believed would reduce the impact of taxpayers withholding too much. The change went into effect in October 2018. In February, he acknowledged that it wasn’t an old error, but a mistake on his part. This was a $365 million mistake. This week’s revelations strongly suggest that the Parson administration tried to downplay their income tax fiasco as long as possible. The administration has offered conflicting stories, withheld information, then accused others of playing politics. Taxpayers were already in for a surprise on their tax bills, and this cover up is just the latest surprise. Lawmakers must now get to the bottom of whether the administration has been truthful about their revenue projections as they finish work on the budget. House Minority Leader Quade and our legislative Dems aren’t going to let the Director’s resignation absolve the Parson administration of their responsibility in this entire debacle. And as the Missouri General Assembly breaks for their annual, week-long spring recess, the KC Star has accurately noted that the honeymoon period for Parson is over. With very little in the way of accomplishments so far, the divisions among the Governor and his members of his own party worsen. The House Budget Committee on March 13 approved its version of the nearly $30 billion state operating budget for the upcoming 2020 fiscal year. The full House of Representatives is expected to debate the 13 appropriations bills that make up the budget shortly after the legislature reconvenes on March 25 after its annual spring recess. The House committee version doesn’t include the spending authority for Gov. Mike Parson’s proposal to issue $351 million in bonds to provide additional funding to the Missouri Department of Transportation for bridge repairs. The governor’s borrowing plan ultimately would have cost taxpayers $100 million in interest over 15 years. House Budget Committee Chairman Cody Smith, R-Carthage, instead included $100 million in general revenue for road and bridge construction in FY 2020. According to MoDOT, lawmakers have never previously appropriated general revenue for construction since a constitutionally dedicated funding source for that purpose was established in 1928. House Democrats questioned the wisdom of redirecting that much general revenue when areas of the budget that rely on it already are being squeezed. The committee followed Parson’s recommendation of a $61 million increase in basic state funding for local public school districts – the minimum amount needed to claim “full funding” under the state’s education funding distribution law. However, the committee plan would increase student transportation spending by $5 million – half of the $10 million requested by the governor. As a result, student transportation funding would be about $190 underfunded from what state law says it should be. On higher education, Parson recommended that state appropriations for public colleges and universities remain at FY 2019 levels but the committee trimmed that recommendation by about $9 million. Once the budget process clears the House, it will advance to the Senate. Lawmakers face a constitutional deadline of May 10 to pass final versions of the appropriations bills that make up the budget. The governor must act on the budget measures before the FY 2020 fiscal year begins on July 1. 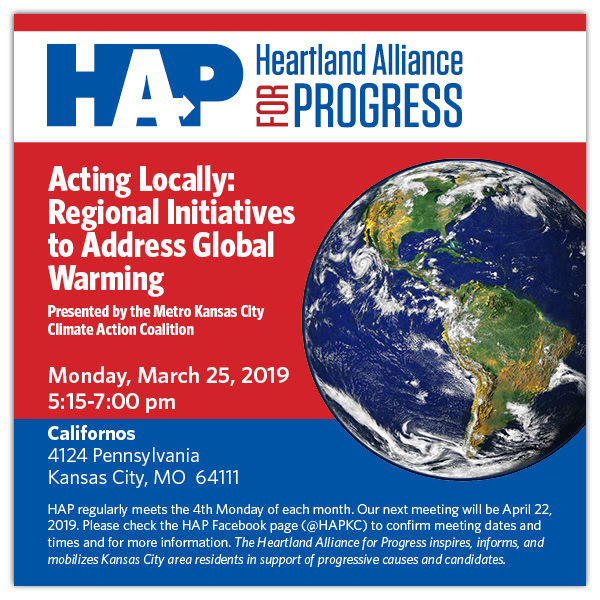 Heartland Alliance for Progress: Monday, March 25th 5:15pm at Californo's (4125 Pennsylvania, KCMO). Regional Initiatives to Address Global Warming featuring Mike Kelly, Mayor of Roeland Park, KS; Lindsey Constance, Shawnee, KS City Council Member; and Dennis Murphey, Chief Environmental Officer, the City of Kansas City, MO. Rep. Jerome Barnes Town Hall: Raytown Wellness Center (10301 E 350 Highway) Tuesday, March 18th 6:00-7:30. Specific topics will include medical marijuana and REAL ID. 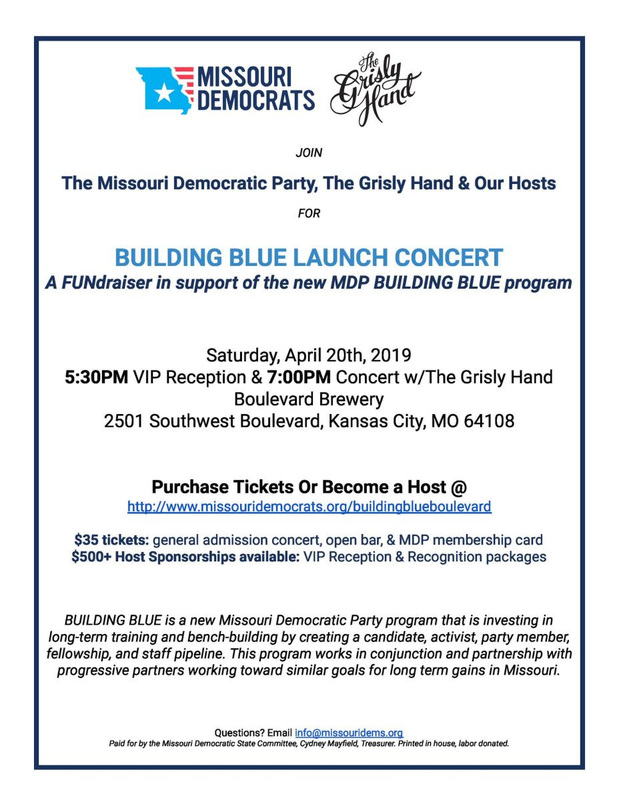 Raytown Democratic Association: monthly meeting Thursday March 21, 6pm dinner, 7pm meeting. Las Chili's, 6210 Raytown Trafficway. 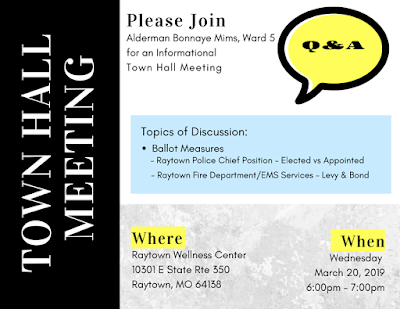 Most Raytown municipal candidates will be present to speak about the upcoming election.